Infer Inc. is a leading provider of predictive technologies that help companies win more customers and gain deeper insight into the untapped revenue opportunities within a business’ existing pipeline. 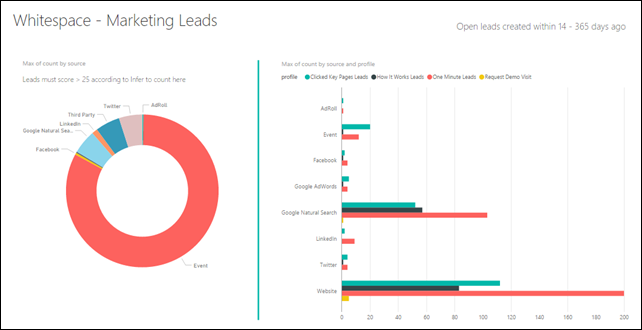 The new Infer sales analytics package for Microsoft Power BI allows sales and marketing leaders to easily find deals that will close quickly, leveraging Infer’s Predictive Intelligence through Power BI’s rich dashboards and interactive reports for easier understanding and live monitoring. ● Marketing Leads: By identifying good leads and accounts in a company’s nurture database and monitoring how long they’ve been neglected, leaders can use this dashboard to pinpoint segments that need more attention, monitor conversion trends across lead sources and account-based marketing tactics, and build goals on these metrics. ● Sales Development (SDR) Accounts: This dashboard allows leaders to find both inbound and outbound accounts that are ripe for more aggressive follow up, and determine the appropriate strategy to achieve this, such as redistributing accounts to SDRs with more bandwidth, or providing more context into why and how they should be targeted. ● Account Executive (AE) Opportunities: Sales executives can monitor older opportunities that remain assigned to quota-carrying AEs for too long without receiving enough attention. This dashboard helps them consider which prospects should be assigned back to SDRs, and which should be revisited by AEs to help rebuild pipeline for the next quarter. ● Whitespace Scorecard: Infer’s overall scorecard presents a simple, big picture view by adding up all the “whitespace” opportunities across a company’s pipeline, applying predicted conversion rates, and forecasting how much topline revenue can be closed in the current quarter. To access this sales analytics package, users first need to sign up with Infer. 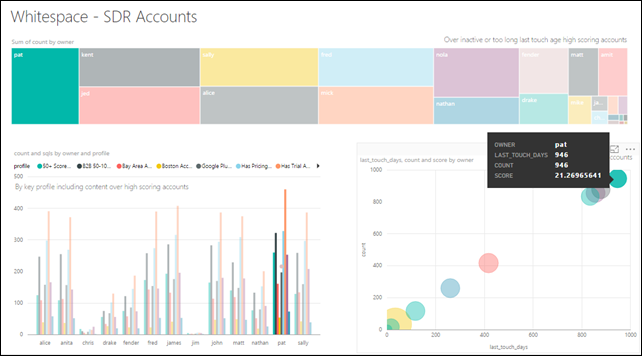 After that Infer’s customer support team will work with them to activate the Power BI dashboards and reporting package.